Any feasibility study needs an assessment of the competing technology landscape. 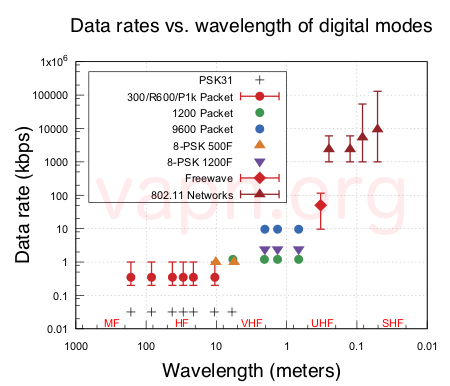 Following our doctrine the following figure shows the data rate vs. frequency (as wavelength) of several ham inspired digital methods. This graphic is used elsewhere in the main pages of this site. It shows the general trend of high speed with higher frequency. More digital modulation techniques deserve to be on this graph, but the above provides enough perspective to show where packet fits into the landscape. There is no doubt other digital modes belong on the graph above (i.e. Pactor, Clover, etc. ), but the VAPN is focusing on minimizing footprints in many ways including spectrum use in the MF/HF segments.